for Specialist Medical Officers jobs under specialization of General Medicine, General Surgery, Obstetrics & Gynaecology, ENT, Dermatology and Venereal Diseases (Skin), Anaesthesia, Paediatrician, Ophthalmologist, Orthopaedic Surgeon, Radiologist. Qualifications for SMO Jobs is MBBS with post graduate degree or Diploma in relevant specialization (General Medicine/ General Surgery/ Obstetrics & Gynaecology/ Laryngological & Otology/ Skin Dermatology and Venereal Diseases/ Anaesthesia/ Child Health/ Ophthalmic Medicine/ Orthopaedic/ Radio Diagnosis) from the recognized University established by Law in India. Maximum age for KPSC SMO Jobs is 42 years and minimum age limit is 21 years. Please see the given details for Age relaxation, Age details, Educational qualifications of Karnataka Public Service Commission KPSC Specialist Medical Officer Jobs Recruitment. KPSC has issued recruitment notification for employment of candidates for total 1430 posts of Specialist Medical Officer, Medical Officers. Applicants with necessary qualifications have to go through Karnataka PSC official website at www.kpsc.kar.nic.in. Open the KPSC recruitment link and select specific to which candidate willing to apply. Fill the respective fields and submit the application from 10/August/2017. Last date to send KPSC application form is 11/September/2017. Application fee for general candidates is Rs.300/- and for Cat 2A, 2B, 3A, 3B candidates is Rs. 150/. Application fee for other candidates is Nil. 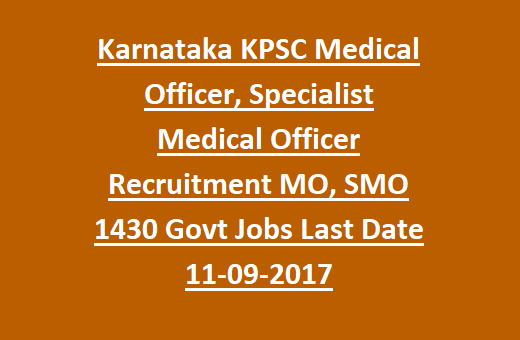 For more details of Application procedure, application fee of KPSC Specialist Medical Officer jobs are mentioned below. Interested candidates with required qualifications can submit applications in prescribed format through KPSC website www.kpsc.kar.nic.in. Selection of candidates is based on recruitment test and Interview. For KPSC Specialist Medical Officer jobs pay scale is Rs. 30,400/- to Rs. 51,300/- and for GDMO jobs is Rs. 28,100/- to Rs. 50,100/-. Further details of Selection method, salary, Method of application of KPSC Medical Officer Jobs are stated below. Post Name: Specialist Medical Officer, General Duty Medical Officers. Total No of vacancies: 1430 posts. Total no of vacancies in KPSC Recruitment are 1430 posts. - General Medicine: 257 posts. - General Surgery: 101 posts. - Obstetrics & Gynaecology: 167 posts. - Dermatology and Venereal Diseases (Skin): 79 posts. - Orthopaedic Surgeon: 31 posts. 2. General Duty Medical Officer (GDMO): 365 posts. Candidates will be offered salary for SMO posts is Rs. 30,400/- to Rs. 51,300/- per month. For General Duty Medical Officer posts is Rs. 28,100/- to Rs. 50,100/- per month. Candidates must hold MBBS with post graduate degree or Diploma in General Medicine/ General Surgery/ Obstetrics & Gynaecology/ Laryngological & Otology/ Skin Dermatology and Venereal Diseases/ Anaesthesia/ Child Health/ Ophthalmic Medicine/ Orthopaedic/ Radio Diagnosis from the recognized University established by Law in India. General Duty Medical Officer candidates must hold MBBS degree and should work in the rural areas for a period of 06 months. Maximum age limit for Cat-2A, 2B, 3A, 3B is 45 years. Maximum age for SC/ ST/ cat-I is 47 years. KPSC selection authority will be conducted a recruitment test to select candidates for KPSC Specialist Medical Officer Jobs and followed by Interview. 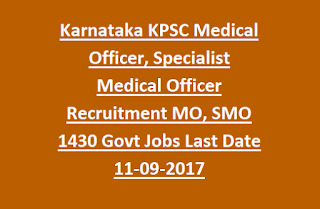 Interested candidates for KPSC Specialist Medical Officer jobs need to go through Karnataka PSC official website @ www.kpsc.kar.nic.in. Search for desired job to which the candidate want to apply. Fill all entries of KPSC application form and submit with necessary documents mentioned by KPSC Commission. Application form submission starts from 10/August/2017 and last date is 11/September/2017. For all other candidates is application fee is Nil. Starting date for submission of KPSC applications: 10-August-2017. Last date for submission of KPSC online applications: 11-September-2017. Last date to deposit application fee: 12-September-2017. The word of mouth in social media optimization is spread through social networking, blogging.